“When Democracy Builds”. Milwaukee Art Institute Bulletin. November 1945. Vol. 18, No. 5, Page 1.
to inculcate an appreciation of its offerings. In 2013, the Milwaukee Art Museum will celebrate its 125th anniversary. Since 1888, the Museum has featured over 3,600 exhibitions, acquired 30,000+ objects, and published hundreds of exhibition and Collection catalogues. The Museum has been instrumental in setting national standards for excellence in art education, and has also erected visionary architecture. An exciting 125 years indeed! 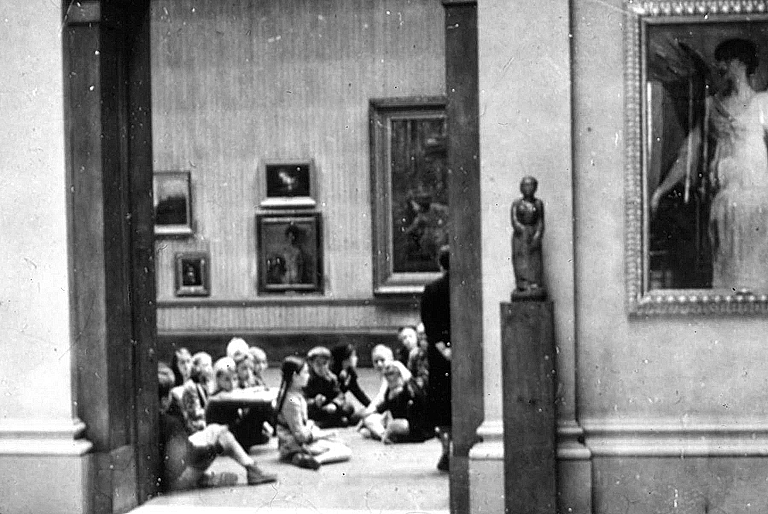 Children in the Layton Art Gallery space, early 20th century. Milwaukee Art Museum, Institutional Archives. In 1913, the Milwaukee Art Society mounted a sale exhibition of 25 paintings by African-American artist Henry Ossawa Tanner. In 1914, Dudley Crafts Watson, Director of the Milwaukee Art Society, and the artist Manierre Dawson, curated The Modern Spirit: Exhibition of Painting and Sculpture. The exhibition was inspired by the New York Armory Show of 1913, officially known as The International Exhibition of Modern Art. 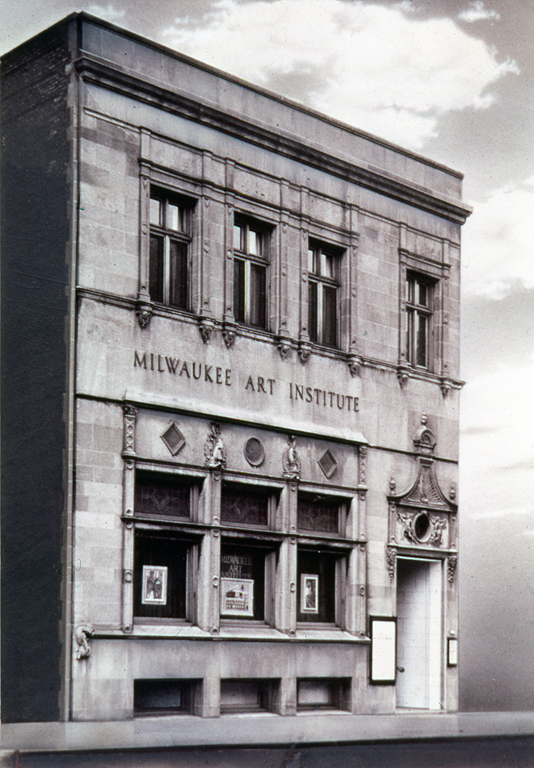 Milwaukee’s was first exhibition of modern art at a museum, just one year after the Armory Show introduced Modernism to America. See the exhibition catalogue here. In May 1916, the Milwaukee Art Institute featured the premiere exhibition of American Modernists, including Charles Sheeler, Morton Livingston Schaumberg, Charles Demuth, and John Marin. In December 1931, the Milwaukee Art Institute exhibited Photographs by Moholy-Nagy. Exterior façade of the Milwaukee Art Institute, early 20th century. Milwaukee Art Museum, Institutional Archives. 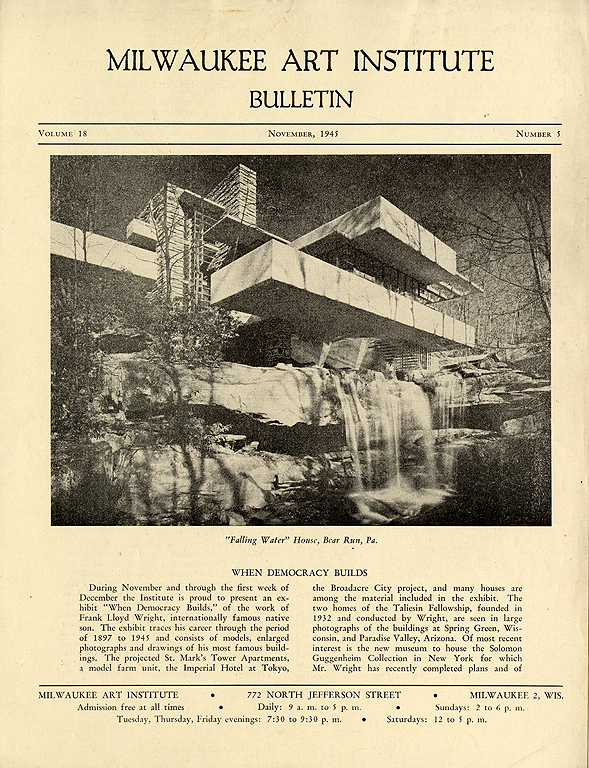 In November 1945, When Democracy Builds, an important Frank Lloyd Wright retrospective organized by Mary Frances “Polly” Coan at the Milwaukee Art Institute, broke all previous attendance records with 11,868 visitors over four weeks. In September 1954, the First Annual Exhibition of Creative Photography from six states, sponsored by Boston Store and Milwaukee Photo-Pictorialists, was held at the Milwaukee Art Institute. Purchases of works of art from the exhibition inaugurate the permanent collection of photographs at the Institute. In December 1966, Milwaukee Art Center organizes Fernando Botero’s first major one-person exhibition in the United States. In 1968, the Milwaukee Art Center organized the first U.S. museum exhibition outside of New York City for the artist Cy Twombly. What was the first exhibit you attended? What has been your favorite exhibition? Did you take art classes at the Layton Art School or the Milwaukee Art Museum? We look forward to a year of excitement and celebration and cheers to the next 125 years! This entry was posted in Behind the Scenes, Library/Archives and tagged 125th Anniversary, archives, Layton Art Gallery, library, Milwaukee Art Institute, Milwaukee Art Museum 125th Anniversary. Bookmark the permalink.